Knowing the musical backwards and forwards has actually helped me while reading, keeping the greater narrative arc in view despite frequent digressions analyzing corrupt church leadership, all of the potential reasons Napoleon lost at Waterloo, or the value of monasticism to society. The unabridged French edition is 1,254 pages, which I read alongside the Fahnestock and MacAfee translation, an update of Charles Wilbour’s 1862 original. In November, it had only been a week or two since the gilets jaunes began blocking roads and spending their Saturdays protesting in city centers. At the time, the protesters united around their shared opposition to a planned fuel tax increase, the burden of which would disproportionately fall upon rural, low-income families who rely on cars to get to work. President Emmanuel Macron, for his part, managed to become emblematic of the problem despite running for president on a centrist, anti-establishment platform, opening himself up to the epithet “president of the rich” when he cut funding to a housing assistance program and then ended France’s wealth tax. 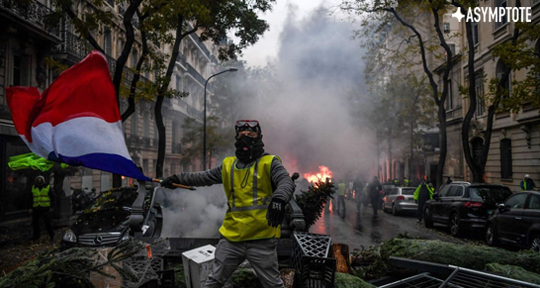 The fuel tax, a part of Macron’s fight against climate change, did not go over well—the elites in Paris “talk about the end of the world, while we’re talking about the end of the month,” one frustrated protester told Le Monde. By the time Macron suspended the tax increase in early December, it was too late—the movement had already spun out of control and grown to encompass all of the splintered and sometimes contradictory grievances of dissatisfied working-class voters looking for someone to blame for growing income inequality and diminished purchasing power. The fuel tax was the out-of-touch straw that broke the camel’s back, unleashing the pent-up fury of thousands of workers and retirees who felt hurt by Macron’s policies, heirs to a long and storied legacy of French public anger succinctly expressed by taking to the streets and setting things on fire. There’s a proverb that says, “When elephants fight, it is the grass that gets trampled.” In a 1973 speech, Prime Minister Lee Kuan Yew of Singapore added to the expression: “When elephants flirt, the grass also suffers. And when they make love, it is disastrous.” The gilets jaunes are tired of feeling like the grass beneath the feet of rich, policy-setting elephants. In any case, the actions of the powerful few have far-reaching consequences for everyone but them. People are saying, “I can’t manage to feed myself, or my family. Christmas is coming up, and I can’t buy presents for my kids.” And, for me, a sentence like that is so much more political, so much more powerful, than all of this discourse about “the Republic,” the “people,” “coexistence,” “democracy.” What does any of that mean? These grand concepts that don’t really reflect anything. Nothing real, nothing corporal, at least. I was struck by that same pervasive sense of helplessness from the beginning of Les Misérables: Jean Valjean receives an initial sentence of five years in prison for stealing bread to feed his starving family. Fantine, upon losing her factory job, turns in desperation to prostitution to support her child, and is nearly left to die in jail for defending herself against a rich man’s cruelty. At best, the state, personified in Inspector Javert, turns a blind eye to the condition of its people, and at worst perpetuates the injustice itself. This is certainly one way to get noticed. The gilets jaunes protest down the street from my apartment in Le Havre on Saturdays, clashing with riot police and getting teargassed for their pains. Their children are my students, who occasionally burst out chanting “Macron démission!” in the back of the class. They’ve been disrupting my route to work for months, burning tires on roundabouts and blocking several lanes of traffic at a time. Politicians have been falling all over themselves to try to co-opt the movement or at least use it to bolster their street cred, but so far it has shrugged them all off, refusing to be categorized as either left- or right-wing. The movement stretches to include business owners and their employees, my colleagues in the public education system and retirees, violent casseurs and this group in Rouen that spent Christmas Eve distributing meals to the homeless. A list of forty-two demands released in November includes elements as simple as raising the minimum wage and as sweeping as establishing a public referendum system to propose laws, as specific as capping class sizes at twenty-five students and as vague as “create more jobs.” Unlike the union strikes or labor movements France has seen in recent decades, the gilets jaunes have no organizing structure, leader, or even a unified ideology. Any ideology, that is, beyond getting rid of Macron. Everyone’s equal when they’re dead. Much of the second half of Les Misérables unfolds against the backdrop of the June Rebellion of 1832, a failed revolt against King Louis-Philippe, coming only two years after the July Revolution ended the Bourbon Restoration and put him in power. (He would later abdicate after another revolution in 1848.) Republicans, who had revolted against Charles X in 1830, felt cheated by the installation of yet another king, but overestimated the support of a people with revolution fatigue: “They have been walking since daybreak, it is the evening of a long, hard day,” Hugo explains. “They did the first relay with Mirabeau, the second with Robespierre, the third with Bonaparte, they are thoroughly exhausted.” Beyond fatigue, though, is a harsh pragmatism: you can’t eat democracy. It’s difficult to care about political ideals when you are starving. Hugo, writing in the 1860s, likes to play historian as well as storyteller, following the rise and fall of empire and monarchy as it sets the stage for his characters. Napoleon enters and exits the scene in the nineteen years Jean Valjean is in prison, and when Valjean is released, the world around him has changed completely—and yet not at all for the lower classes. Marius Pontmercy rebels against his royalist grandfather to become a Bonapartist like his estranged father, and then joins a group of republican students to fight at the barricades in 1832. The cast changes, the battle lines shift, but the revolutions keep coming from a people who refuse to lie down and take it even though the elephants trample all over them. The story of Les Misérables, like the history of France, is a constant clash of the elements. Shortly after taking office in 2017, Macron told Der Spiegel, “Not to put too fine a point on it, France is a country of regicidal monarchists. It is a paradox: The French want to elect a king, but they would like to be able to overthrow him whenever they want.” Every new leader comes to power on visions of a better tomorrow that never seems to arrive. Bit by bit, revolution by revolution, France inches forward in search of its ideal of a just society, and every revolution thinks it will be the last one. The gilets jaunes seem determined to become the next chapter in French revolutionary history, but the source of their broad appeal—crowdsourced leadership that eschews traditional political branding—is also their greatest weakness. For all that they want to be rid of Macron, I have yet to hear a word on who would be an acceptable alternative, or what they believe Macron’s absence will accomplish. Without a unified, achievable vision for the future, even removing Macron from power and upending the French political system won’t solve the problems at hand, and the cycle of policy and protest will go on indefinitely. This barricade is made neither of paving stones, nor of timbers, nor of iron; it is made of two mounds, a mound of ideas and a mound of sorrows. Here misery encounters the ideal. Here day embraces night, and says: I will die with you and you will be born again with me . . . Brothers, whoever dies here dies in the radiance of the future, and we are entering a grave illuminated by the dawn. Claire Jacobson was until recently the Assistant Interviews Editor at Asymptote. She studied Francophone literature at the University of Iowa, and now works as a teacher, writer, and Arabic translator.